Can you remember a time when your days were spent marveling at the world around you? When afternoon naps were a daily occurrence and evenings were passed beside the flickering amber flames of a camp fire? When playtime was so all consuming that time seemed to disappear? How long ago was it? Days? Months? Decades? Since childhood? Never? For me, it was less than a month ago on safari in Botswana. For eight blissful days, I viewed leopards, lions and zebra instead of television. I napped in the afternoon sun beside a private plunge pool in lieu of answering e-mails and dined al fresco beneath a dazzling night sky in the convivial company of new friends rather than surfing Facebook. Each night I fell asleep cocooned in tented comfort listening to the orchestral sounds of crickets instead of my iPod. I was unplugged, carefree and immersed in the present moment. And as if that wasn’t luxury enough, there was Botswana itself, one of the richest natural habitats on earth. From the sandy savannahs of the Kalahari Desert to the wide grassy floodplains of the Okavango Delta and the vast drylands of the Savute, Botswana is home to some of Africa’s most exclusive safari experiences. With the ease of chartered flights, the trip hopped from camp to camp, habitat to habitat, and one unforgettable experience to another on a custom tour handcrafted by Africa safari specialists, Extraordinary Journeys. To help jump start the day, steaming thermoses of coffee or tea and fresh baked pastries were delivered to the tent for a wake up call. There were massage therapists to ease away any kinks that bouncing around in safari vehicles might incur. Gourmet meals were paired with impeccable South African wines. 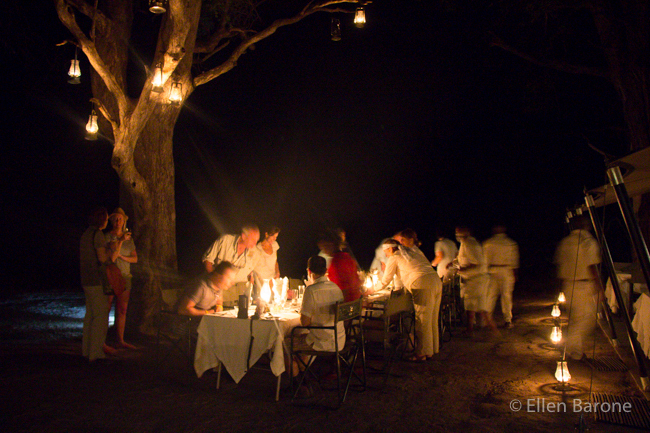 Fireside aperitifs were standard perks, as was the private safari guide who greeted the plane at each camp, accompanied every game drive and revealed the secrets of the landscapes with a passion and knowledge that was infectious. There were six of us. All women. All American. Each well traveled. Aged from twenty six to sixty six, some of us had husbands at home. A few were longtime friends. Others were traveling solo. One was engaged to be married. Another was single by choice and reveling in her independence. We got along brilliantly, laughing and bonding as only travel women can do. We settled easily into the rhythms of safari life: rising at dawn for morning game drives, returning for lunch and an afternoon siesta, then heading out again for more game viewing and Sundowners (the African tradition of enjoying a drink while watching the sun go down) before heading back to camp for dinner, a bonfire and another night of sleep in tented elegance. In the arid Kalahari Desert, at Meno a Kwena safari camp, we walked with native Bushmen as they introduced us to their ancient hunter-gatherer culture through demonstration, song and dance using the extraordinary tonal clicks of the Bushmen language. We also learned about the unpredictable Boteti River, over which the camp sits scenically perched, and how camp owner David Dugmore and his staff pumped water for nearly twenty drought parched years to provide wildlife with a vital life line until the rains returned and the river flowed again in 2011. 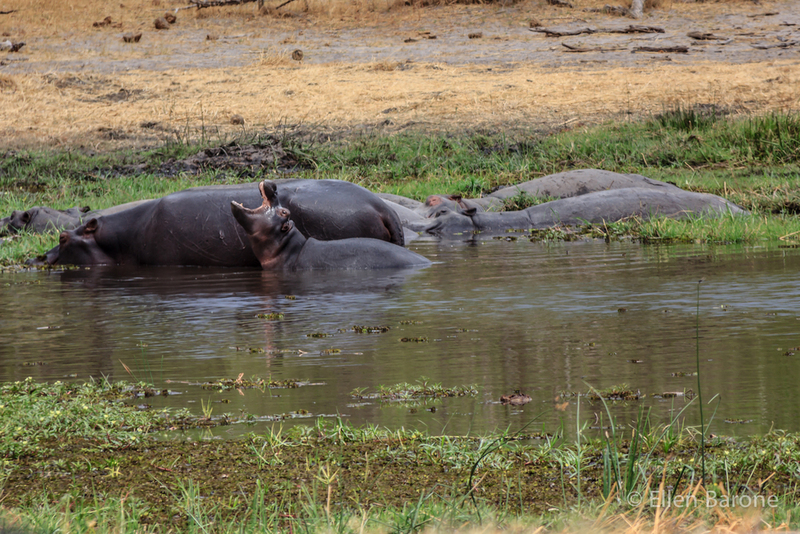 At Machaba Camp on the eastern tongue of the Okavango Delta, we tracked hyenas and wild dogs and swam in a riverside pool where a pod of snorting hippos, including a rambunctious baby calf, cooled off in the muddy shallow water beyond us. I celebrated my 50th year on this planet in the heart of the Okavango Delta at &Beyond Xaranna with one of the trip’s most memorable activities: exploring in a mokoro canoe. When I am asked about the trip, it’s this quintessential experience that I most frequently recount. The vulnerability of being afloat in hippo filled waters. The engine-free silence of the shallow boat. The languid balmy breeze that ruffled the grassy reeds. The delicate water lilies. The golden glow of the setting sun, and the vast African sky above. And just when I couldn’t imagine a more memorable experience, Botswana delivered the unimaginable. 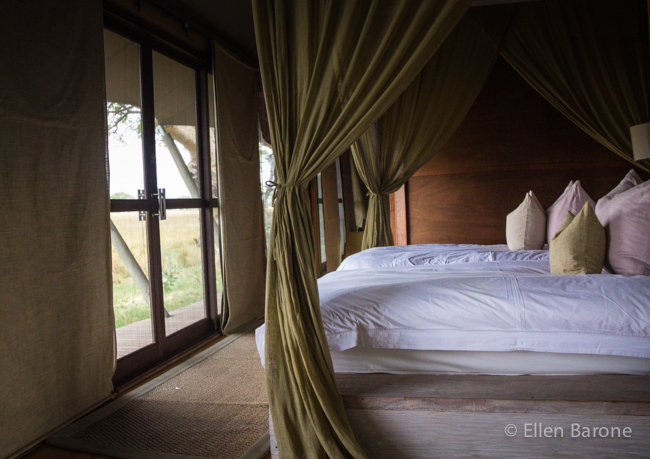 It was our last morning at Savute Elephant Camp in Chobe National Park, a landscape famous for its large herds of elephants and cape Buffalo. 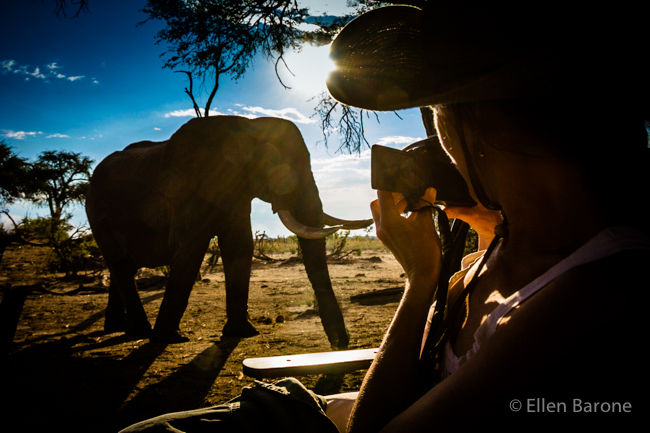 During our two days at Savute (also known as Savuti), we’d had elephants lumber by the safari vehicle so close, so uncomfortably close, that I found myself holding my breath. We watched giraffe amble across the dry Savute Marsh, a dusty relic of a once vast lake, and had felt the ground tremor beneath the rumble of a massive buffalo herd. We’d seen kudu, impala and warthogs, and awakened to a pack of wild dogs yipping and playing over their morning breakfast not far from the tent. Then there was the leopard. The leopard that climbed effortlessly onto a tree branch overhanging the front deck of my tent. The leopard that locked eyes with me as I took his photograph. The leopard that suddenly leapt from the tree straight toward me. I froze. Not because I’d been told not to run if a wild leopard leaps out of a tree at me, although I may have been. I stood frozen in fear. One second the leopard was in the tree, the next second he was on the ground a few feet from me, the next second he’d made the life-saving decision to escape beneath the deck. Time stopped. Awareness disappeared. I don’t know how long it was before I noticed my friend Susan’s hand on my elbow as she pulled me into the tent. Then slowly, consciousness of my breath, my trembling hands and my weak knees returned. Susan and I giggled in waves of nervous laughter, the lingering aftershocks of shock and awe. Witnesses from neighboring tents appeared and chattered away like sports commentators with play-by-play reconstructions of the encounter. As my fog of fear lifted, a clearer picture of the incident began to take shape: the wild dogs that had treed the big cat; the camp guests who, unaware of the leopard’s presence, had startled him; the warning growl; the choice of the panicked animal to flee and avoid a confrontation. If a vacation is measured by the quality of its memories, Botswana absolutely delivered. Discover country highlights, things to do, travel tips, image galleries, and more at Botswana Tourism. For the best combination of expertise, access, and value in travel to Africa, speak with a specialist at Extraordinary Journeys. 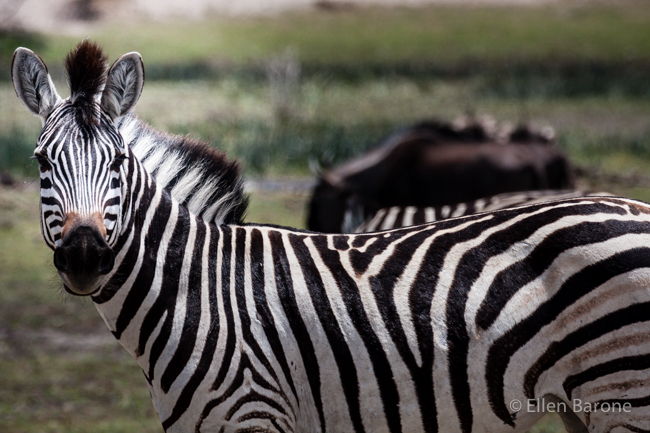 Learn what to pack for an African safari. Click here to view more Botswana photography.